Business process innovation is on the minds of executives these days, and for good reason. In the 1990s, companies also had a focus on business processes. They used enterprise-wide networks to tear down walls between functional departments and reengineered their companies to remain competitive. Today, the universal connectivity of the Internet makes it possible to tear down walls between companies to reinvent entire value chains. The result? We are now witnessing a grand globalization of white collar work, outsourcing, offshoring and other new forms of extreme competition. Industry and national boundaries have become a blur. All is changed, and no industry is exempt. Pioneering companies have already disrupted incumbents and come from nowhere to dominate their industries. Their secret sauce? Business process management (BPM). This book brings together some of the best minds to explore the role and value of BPM, and what it portends. In its pages you will find the essential discussions and insights, straight from the thought leaders. In Search of BPM Excellence is for those who want to sustain the success of their businesses in the midst of the current sea of change. Is your company ready for extreme competition? Where do you go to gain insight into this thing called BPM? Why is business process management so important / how important is it? What should you be considering when making BPM Next Practice? How will you get there and make sure you get where you want to go? Who needs BPM, do I? These are questions of greatest importance to business people and the Business Process Management Group has tracked down the leading thought leaders, analysts, methodologists and consultants in the field of business process management to get the answers.BPM sits at the heart of the Business Evolution we have now begun to experience – and that will continue to be a primary economic driver over the next several decades. This book, In Search of BPM Excellence, is for those who want to sustain consistent, ongoing success, profit, and growth of their businesses in the midst of the current sea of change. This is the book for those in search of excellence. We would like to thank all of the authors for working hard to make this book the insightful collection of information that it is. 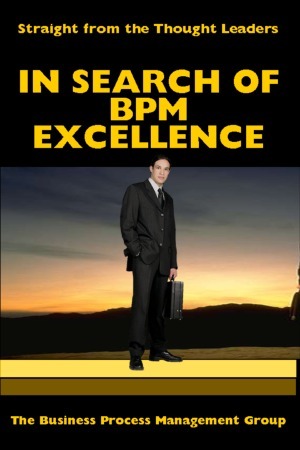 There is certainly no other book like this and the sweeping scope of In Search of BPM Excellence opens the door to insights likely to play out in numerous important decisions and actions for many years. 2. BPM: From Common Sense to Common Practice. 3. Operational Transformation: Get Ready For Extreme Competition. 6. BPM and “Next Practice”. 13. Applying BPM in Manufacturing. 14. Five Fables and Their Lessons. Steve Towers is the co-founder and CEO of the Business Process Management Group, a global business club (established in 1992) exchanging ideas and best practice in BPM and change management. The BPMG has now over 10,000 members across all continents and business sectors and leads the thinking in the BPM community. Steve is recognized internationally for his contribution to business process and change management, speaking and working throughout the world with leading organizations in the public and private sector. Steve is also one of the four co-developers of the 8 Omega Framework for Business Process. An innovative approach to BPM and change that enables organizations large and small to embrace BPM in a structured and inclusive way. He is an active practitioner working at the leading edge of BPM and understands the realities of implementing large-scale change in often complex environments. Steve’s engagements cover all continents over the last decade with an easy and yet incisive style geared to helping people directly test the ideas, experience and solutions from the Business Process Management Group. Roger Burlton is the founder of the Process Renewal Group. He is considered a global leader in the introduction of innovative methods for change and is recognized internationally for his pioneering contributions in Business Process Management since 1991 when he wrote his first papers, conducted his first BPM consulting and taught his first course. Roger has chaired several high profile conferences on BPM globally, including Knowledge and Process Management Europe, the annual National Business Process Re-engineering Conference in the US and Software World Canada. Roger also chaired the annual conference for the Business Process Management Group in 2003, 2004 and again in 2005 and has run the DCI BPM Conference series in the US for the past two years. His pragmatic BPM seminar series are the longest continuous series of their kind in the world. They run regularly in North America, Europe, Australia and South America and have been translated into multiple languages globally. Roger’s highly acclaimed book ‘Business Process Management: Profiting from Process’ is regarded as the reference book for process professionals who want to actually conduct process architecture initiatives, and process renewal projects as well as those who wish to entrench process stewardship across the enterprise. Roger graduated with a B. A. Sc. in Industrial Engineering at the University of Toronto and is a certified Professional Engineer in the Province of Ontario. He can be reached at rburlton@processrenewal.com. Peter Fingar, Executive Partner in the digital strategy firm, the Greystone Group, is one of the industry’s noted experts on business process management, and a practitioner with over thirty years of hands-on experience at the intersection of business and technology. Equally comfortable in the boardroom, the computer room or the classroom, Peter taught graduate and undergraduate computing studies in the U.S. and abroad. He has held management, technical and advisory positions with GTE Data Services, American Software and Computer Services, Saudi Aramco, EC Cubed, the Technical Resource Connection division of Perot Systems and IBM Global Services. In addition to numerous articles and professional papers, he is an author of the landmark books: The Real-Time Enterprise: Competing on Time, just-released, and Business Process Management: The Third Wave, now in its fifth printing (www.mkpress.com). Andrew Spanyi is the Managing Director of Spanyi International Inc., a consulting and training company in organization and business process design. He is the author of the book Business Process Management is a Team Sport: Play It to Win! (www.mkpress.com). His current practice focuses on assisting leaders to transform traditional mental models and behaviors towards ones based on enterprise business process principles. He was previously affiliated with The Rummler-Brache Group [RBG]. Since 1991, Andrew has worked on over 135 major performance improvement projects across several key industries in both the USA and Canada. Previously, he worked as a Senior Vice President at SCONA, a specialty financial services firm, and prior to that assignment he was the Director of Marketing and Product Development with Xerox Learning Systems (AKA as Learning International, Achieve Global). Andrew speaks regularly at conferences on Business Process Management. He has written extensively on business process issues and has had articles appearing in magazines such as Strategic Finance, Financial Executive magazine, Industrial Engineer, Manage Online, and on a number of Web sites including www.bpmg.org and www.bpminstitute.org. He holds a Bachelor of Arts (Economics), and earned his MBA from York University. He is an executive coach with the BPM Group, a Director of the Association for Business Process Management Professionals, and is affiliated with the Babson College Process Management Research Center. Andrew can be reached at andrew@spanyi.com. Adrian George Sahlean, Principal at XCLSoft and Faculty Fellow at the Boston Graduate School of Psychoanalysis, is a published author who holds degrees in both Psychoanalysis and Philology. He brings his unique experience in counseling, coaching, and performance assessment to the understanding of how business process management is applied to corporate innovation and growth. He is the co-author to the upcoming book, The Dynamically-Stable Enterprise: Engineered for Change (www.mkpress.com). Vasile Buciuman-Coman, Founder of eSkill, an online testing service, and of XCLSoft, a consulting company specialized in enterprise architecture. He holds a degree in Aeronautical Engineering and has more than 15 years experience in the IT industry. He held technical, consulting and management positions with companies like Spyglass, eSkill, Instrumentation Lab, Cigna, and PRTM. He is the co-author to the upcoming book The Dynamically-Stable Enterprise: Engineered for Change (www.mkpress.com). Mark McGregor Mark McGregor is a principal of the Business Process Management Group a global business club and is a recognized internationally for his contribution to business process, business modeling and enterprise architecture, speaking and working throughout the world with leading organizations in the public and private sector. Mark has worked with many of the worlds leading vendors of BPM solutions and is a well respected author and writer on the themes of business and process change. Mark is also one of the four co-developers of the 8 Omega Framework for Business Process. An innovative approach to BPM and change that enables organizations large and small to embrace BPM in a structured and inclusive way. Mark has recently contributed to publications such as CIO Magazine, Finance Today, and previously been published in Success Now, Enterprise Middleware, Application Development Magazine, Midrange Computing and Software Developer Magazine. He has also made contributions to two of the leading books on BPM, Peter Fingar's The Real Time Enterprise and Paul Harmon's Business Process Management: A Managers Guide. As a founding columnist for BP Trends Mark leads the thinking on the effective implementation of BPM Solutions and helps organizations bridge the divide between business and information systems. Dr. Pehong Chen, president, CEO, and chairman of the board of Broadvision, is an internationally recognized business visionary in the field of new media and self-service Web applications. He has received numerous accolades for his leadership at BroadVision, including Master of the Universe by Business Week as one of the 25 most influential people in e-business, Entrepreneur of the Year by Ernest & Young, and Fast500 by Deloitte & Touche. Prior to founding BroadVision in 1993, he was vice president of multimedia technology at Sybase, responsible for the company's interactive initiatives. Earlier, he founded and was president of Gain Technology, a leading supplier of multimedia software tools, where he pioneered multimedia as an enabling technology for a new generation of business applications. Gain was acquired by Sybase in 1992. He also helped found Siebel Systems, now a worldwide leader in front office automation software, and served on its board of directors until 1996. Dr. Chen received his PhD in Computer Science from University of California at Berkeley in 1988. Ronald Ross, recognized as the “father of business rules,” is Co-founder and Principal of Business Rule Solutions (BRSolutions.com). BRS provides workshops, consulting services, publications, and methodology supporting business analysis, business rules, and rule management. Mr. Ross also serves as Executive Editor of BRCommunity.com and its flagship on-line publication, Business Rules Journal, which also features John Zachman, Chris Date and Terry Halpin. He serves as Co-Chair of the annual Business Rule Forum Conference. He was a charter member of the Business Rules Group in the 1980s, and is also active in the OMG Business Rules SIG. Mr. Ross is the author of a half-dozen professional books, including Principles of the Business Rule Approach, Addison-Wesley (2003). Mr. Ross received his M.S. in information science from Illinois Institute of Technology, and his B.A. from Rice University. David Lyneham-Brown is the Chairman & Chief Development Officer of the Business Process Management Group. David is a well respected coach and trainer and has worked with numerous Global 5000 firms across the United States, Europe, South Africa and Australia, including Lloyds TSB, Citibank, National Australia Bank, British Telecom, British Aerospace, Dupont and UK Civil Service. He has developed leading edge training and coaching in BPM, Business Analysis and Change Management and is responsible for the international accreditation status of the BPMG training programs. As a result of this work David has been invited to work with a number of leading international business schools, including Exeter Business School, to incorporate BPM training into their MBA programs. As a mentor and writer David is unique in his ‘hands on’ approach and accessible style which translates complex and technical topics into practical toolkits for organization thinking and practice. His writing has appeared internationally in the Institute of Management Journal, Project Manager Today, Pharmaceutical Times and Computer Weekly. Jorge Eduardo Soares Coelho is a managing partner at SisConsult, a management consulting firm operating in Portugal since 1996. He is also an Assistant Professor of Management Information Systems at the University of Minho and at the University Portucalense.. Mr. Coelho is active in professional and educational organizations including serving as the Vice-president of the Commission for Quality in ICTs (CS03) of the Portuguese Institute for Quality and President of the Consultants Academy of Portuguese Association for Quality. He has held numerous educational and management roles including: Lecturer at the Instituto Superior de Engenharia de Coimbra, Head of Department of the Regional Division for Management Control, Industrial and Administrative Organisation and Information Technology of the Portuguese Post Office, managerial responsibilities for the Information Systems and Technology Department at the Price Waterhouse office in Porto, and Lecturer in Management Information Systems at the European University in Portugal. He is the author of the Learn Method, a systemic and integrated, object-oriented BPM approach which has been applied by many companies. He is a regular speaker at graduate and postgraduate courses and seminars on BPM, Quality and IS strategy in most Portuguese universities. Terry Schurter is regarded as the leading independent BPM Analyst and heads up the Research and Delivery practice of the Business Process Management Group. Terry works with the leading BPM solutions providers to bring their tools and approaches to the attention of the BPM Community. He has written and authored many reviews, research pieces and original work appearing in CIO Magazine, BPM Today, and various in-house Fortune 500 publications. Terry is also one of the four co-developers of the 8 Omega Framework for Business Process. An innovative approach to BPM and change that enables organizations large and small to embrace BPM in a structured and inclusive way. Terry works at the leading edge of IT industry best practice in North America and Europe on the theme of business process change. He is well respected and highly regarded for his objective and insightful writings which frequently appear in many popular business journals. Michael McClellan has over 30 years of experience serving and managing manufacturing enterprises. He has held a number of positions in general management, marketing, and engineering, including President and CEO for companies supplying capital equipment and material management systems to nearly every type of manufacturer. In 1985 he and a group of associates founded Integrated Production Systems, a company that pioneered the use of computer systems to manage and track production events on the plant floor. These systems are generally referred to as manufacturing execution systems and have found extensive use in varying forms in production facilities. His first book, Applying Manufacturing Execution Systems, defines manufacturing execution systems and explains the reasoning and history behind them. His newest book, Collaborative Manufacturing: Using Real-time Information to Support the Supply Chain, is the first definitive examination of collaborative manufacturing concepts. He is President of Collaboration Synergies Incorporated, an advisory company providing consulting services in the area of business process management, real-time manufacturing information systems, and collaborative manufacturing system development and implementation. He is a frequent speaker at companies and manufacturing conferences, has presented a number of papers on manufacturing information systems, and holds one patent. He can be reached at mm@cosyninc.com or www.cosyninc.com. Martyn Ould Martyn Ould is an independent consultant on the software development process and the design and diagnosis of organizational and business processes. A graduate of Cambridge University, he has over three decades of software development and business process management experience, working for leading software houses and management consultancies Deloitte, Praxis and Logica. He is a Fellow of the British Computer Society, a Chartered Engineer, and an experienced author. He regularly lectures to public, government and corporate audiences, and teaches at Oxford and Bristol Universities. Martyn has pioneered the development of the Riva method for business process management, and is author of the landmark book, Business Process Management: A Rigorous Approach (www.mkpres.com).